Symptoms of allergies are reactions from the body’s immune system to bodily contact with foreign substances. The body’s immune system mistakenly regards these foreign substances as danger, so it produces histamines to expel them. There’s no response in non-allergic people, but allergic people’s bodies recognize the foreign substance and that’s when the body reacts causing allergies. Allergic producing substances are called allergens. An allergic reaction depends upon the body part, or parts, involved and the severity of the reaction or reactions. Some allergic reactions affect many areas of the body, while others affect just one area. Allergic reactions vary by individual. Some common allergens are dust, pollen, grass, dust mites, pet dander, insects, food and weeds. The most common symptom of allergy is skin itching. Nevertheless, allergy symptoms can be categorized as mild, moderate or severe. Mild allergy symptoms include rash, itchy, watery eyes, runny nose, sneezing, hives, ear fullness, congestion. Mild allergy reactions do not spread to other parts of the body. Moderate allergy symptoms include itchiness, difficulty breathing. Moderate allergy reactions include symptoms that spread to other parts of the body. Severe allergy symptoms (Anaphylaxis) are rare, life-threatening reactions which are sudden and affects the whole body. Itching of the eyes or face is the beginning stage of symptoms. Breathing problems can become difficult or noisy, or the individual may not be able to breathe at all. Another dangerous allergy reaction is shock. Shock occurs when the organs of the body are not getting enough blood because of dangerously low blood pressure. The individual in shock may be pale or red, sweaty or dry, confused, anxious or unconscious. It can lead to cardiac arrest and death. Other severe life-threatening symptoms are fluctuate degrees of swelling that makes breathing and swallowing difficult, abdominal pain, sweating, fainting, sudden increase in heart rate, sudden hoarseness of speech, cramps, vomiting, diarrhea, dizziness, mental confusion. Allergy symptoms can also be caused by reactions to certain medications. The most common drug that causes allergy reactions is penicillin. It can cause itchiness all over the body. Even certain foods such as shellfish can cause hives to some people. 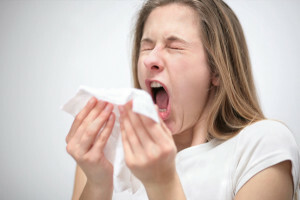 Other things that can make allergies worse are aerosol sprays, air pollution, cold temperatures, humidity, irritating fumes, tobacco smoke or any form of smoke. Allergy symptoms cannot be avoided. Knowing when the symptoms are at their worse and understanding these symptoms can help an individual deal with them. For example, slight reactions with mild symptoms usually respond to over the counter allergy medication. Write down when the allergy symptoms are at their worse. This can be vital information to your physician. Basically, the symptoms can be a result from simple itching to serious respiratory problems or shock (anaphylaxis). A family physician or allergist can prescribe the correct medication to help relieve allergy symptom and may help prevent some of the severe and possibly fatal allergy symptoms.